Photo credit to Simon K.
We couldn’t figure out why on earth this was known as a dream cake! Maybe because you’ll dream about it afterward? If anyone knows the origin, please tell us about it in the comments! Stephanie Ma is a recent adoptee of the pescatarian slow-carb diet. She likes to pretending to be Danish and eats lots of Danish Dream Cake. In her spare time, Stephanie likes shopping for her ever-expanding mustard collection. 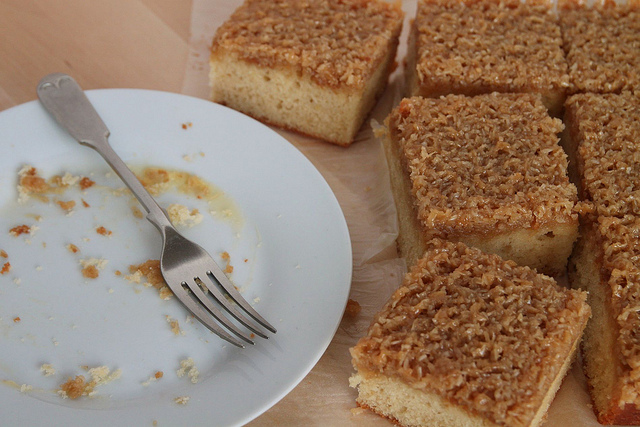 I suggest that you make a really thin cake base, because otherwise it will take forever to bake and you want it to be pretty much cooked all the way through before you pour on the coconut crunch. To make the dream cake topping, simply combine all the topping ingredients in a saucepan. Stirring, cook until all the ingredients have melted and combined. It will be thickened, brown, and saucy. Set aside for later. For the cake: preheati your oven to 400°F. Melt the butter and vanilla extract in a saucepan and put aside to let cool. Next, use an electric mixer and whisk sugar and egg until it is frothy (to the consistency of the bubbles in a bubble bath). Sift the flour, baking powder and fold it into your bubble bath-like mixture. Add your butter and vanilla mixture to your batter, folding gently. Line a cake tray with baking paper (30 cm by 30 cm) and pour the mixture in. Bake for about 20 minutes in your already preheated oven and check to make sure it is cooked by inserting a toothpick. When your toothpick comes out clean, take your cake out of the oven and spread your topping mixture onto the cake. Return to the oven and bake for an additional 13 minutes at 425°F. You will know it is cooked when the topping comes out looking slightly wet and runny. Let it cool for about 4 minutes or until the topping hardens and serve by cutting it into generous wedges. So wonderful you like our drømmekage! As a native Dane I must confess I have no idea why it is called a dream cake… hmm. Just a little tip if you feel like playing with the recipe a little – add some cocoa powder to make it a chocolate cake and then add a little coffee plus cocoa powder to the topping and you’ll get a nice chocolate cake! Think I’m gonna bake a regular one tomorrow though – you inspired me! That’s a great suggestion Nina, thanks for that. I love the topping the most, its delicious. How did your baking go?